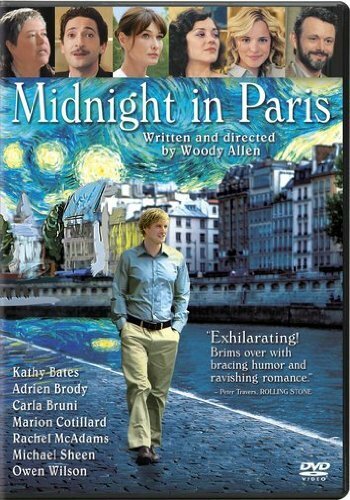 -- Wood Allen's "Midnight in Paris"
The above quote from William Faulkner's "Requiem for a Nun" was used in Woody Allen's "Midnight in Paris" (2011) without permission. It has sparked a copyright and trademark infringement lawsuit. As reported by The Hollywood Reporter, the suit was filed with the U.S. District Court in Mississippi on Thursday. In the movie, Gil Pender (Owen Wilson), who utters Faulkner's words, is a successful Hollywood screenwriter who, to quote The New Yorker ,"considers himself a hack," someone "struggling to write a novel, a dubious-sounding story about a man who lives in the past." The dialogue is categorized in the complaint as both an "infringing quote" and "likely to cause confusion, to cause mistake, and/or to deceive the infringing film's viewers as to a perceived affiliation, connection or association between William Faulkner and his works, on the one hand, and Sony, on the other hand." A good case can be made for fair use of the borrowed language. The studio, if it wishes to litigate the matter, would argue that the screenwriter didn't lack imagination. Allen wasn't padding the script or regurgitating Faulkner. He was bringing new insight to Faulkner, and the words quoted. Among other things, William Faulkner is cultural shorthand for the struggling novelist who turns to Hollywood for fame and fortune. Gil called himself a Hollywood hack. Faulkner called himself a failed poet who took up the novel. Point. Counterpoint. Gil's struggle is the inverse of Faulkner's. How can we learn anything about ourselves if we can't quote enough to make a larger point about the human condition? Put another way, the word "Faulkner" packs a lot of meaning. The motive for quoting Faulkner matters. It was to make a larger point -- not steal bread from the mouths of Faulkner's orphan children. Okay, but the Faulkner orphans might still wonder why Congress would allow Allen to borrow (steal?) their literary property - but not their feeding bottles or bonnets? Fair use allows scholars, researchers and others to borrow or use small (and sometimes large) portions of in-copyright works for socially productive purposes without seeking permission. The doctrine -- which complements the First Amendment -- helps courts avoid rigid application of copyright law where rigid application would "stifle the very creativity which the law is designed to foster." Against this backdrop, fair use can be looked at as a balancing act. It is an imperfect attempt to reconcile the competing ideals of free speech with the property rights of individual creators. Fair use recognizes that the reason for our nation's copyright laws is not so much for individual creators, but, rather to promote the progress of art and science. Regarding the trademark claim, more likely than not it would be dismissed on a motion for summary judgment. Arguably, it's not a trademark use. It's a passing reference in an artistic work to another artistic work. Artistically relevant references to cultural icons, whether dead novelists or consumer products, are often protected under the First Amendment. They call it the Rogers artistic relevance test or exception. Ginger Rogers once tried to stop a movie that included her name in the title. The movie was Fellini's satire "Ginger & Fred," which concerned two retired small-time dancers who were known as Ginger and Fred. When Ginger Rogers learned of the film, she claimed the movie falsely implied she endorsed it - a violation of Section 43(a) of the Trademark Act. Affirming the trial court, the Second Circuit Court of Appeals held that, provided, a celebrity's name has some reasonable "artistic" relationship to the content of the work, and is neither "explicitly" misleading, nor a thinly veiled commercial advertisement, the slight risk that the celebrity's name might implicitly suggest endorsement or sponsorship, may be outweighed by the public interest in free expression. In the context of a recent blog on the HathiTrust ruling, I commented that when suing you have to keep in mind the "clear" purpose of copyright. Copyright may be called a "monopoly," but private reward must be balanced against the public good. Based on what I know, my money is on Mr. Allen and Sony Pictures. You correctly point out that infringement can be large or small. Size does not matter. What matters in determining fair use is intent and actual use, among other things. Filming someone walking down the street passing a copyrighted Keith Haring graffiti on the wall does not make it a commercial use. Similarly the same Faulkner quote used by Obama, Will-I-Am, and Martin Scorsese is fair use in that its use was not for commercial gain. Woody Allen made a commercial film, and seems to have used the quote in the film's denouement as a key to the story's logic - a use that surely enhanced the artistic quality of the film itself. If Woody could have written something better, he would have. If he had wanted to paraphrase, he could have. Ron Howard, when he used a small Faulkner quote to launch "Modern Family" inquired as to the license fee, paid it, and used the quote to enhance the quality of his TV product. That's Ron Howard, an artist and a businessman. The sad truth is both Woody and Sony knew better and simply chose to steal the quote with impunity. All the blogs and comments defending their actions all show the same lack of understanding of the US Copyright Act, and the inexplicable desire to access intellectual property for free. Congress established expiration dates for copyrighted art. By doing so Congress felt that eventually art should be free to all. But they also underscored that in the meanwhile, one needs to pay the piper.